As regulatory pressure increases and investment strategies become more complex, Private Equity funds are outsourcing their administration operations in order to put their focus on generating returns. At Centaur, we understand what is important to the Private Equity sector. Our experienced Private Equity team provides specialist accounting, investor relations, customized reporting and day-to-day management of our clients’ funds. Private Equity structures can be complex. At Centaur, we firstly listen to our clients until we understand their needs. Only then do we provide specialized administration services that are both responsive and transparent. Centaur has invested heavily in a technology platform which delivers open, transparent, customizable reporting, which is based on client requirements. We use a combination of the best of both internal and external systems and ensure the most secure and robust processes are in place. We continuously review the workflows and invest accordingly to ensure the professional service provided to the funds and the investment is of the highest standard. Our legal, corporate and operational teams provide the expertise and assistance to ensure a smooth transition and launch of Private Equity funds. Review of all legal documentation and structure and provide comments. Ensure all agreements are in place and regulatory filings completed. Review of workflows between each legal entity and the stakeholders of the fund. Review of financial statements and current book and records. Provide transition or launch plan and detailed list of information required to all parties to transition or launch the fund efficiently. Organizing and attendance at Board meetings. Preparation of corporate resolutions and minutes. General administration, such as assisting with the opening of the Fund’s bank accounts, arranging annual general meetings and attending Board Meetings as company secretary. Monitoring the appointment of the Liquidator and liaison for all steps to wind up the Fund. Maintaining books and records and all relevant supporting documentation. Daily review of transactions and cash reconciliation. Liaise with banks, custodian or investment manager to ensure the funds operations are properly recorded. Record keeping in accordance with relevant Accounting Standards. Maintenance of books and records of SPVs. Preparing consolidated annual and semi-annual financial statements, including supporting schedules. Management of audit and tax requirements. Centaur delivers accurate and timely reports to all stakeholders, built to meet individual client requirements. Our highly trained team, technology and infrastructure allow us to deliver accurate, on-time reporting and a responsive service to our clients. All data recorded is available to feed other platforms and enables us to customize our service model and reporting to each client. Investor communications, including capital calls, distributions, detailed statement on valuation day, management account and new letters. Execution of payments for distributions and other cash movements. 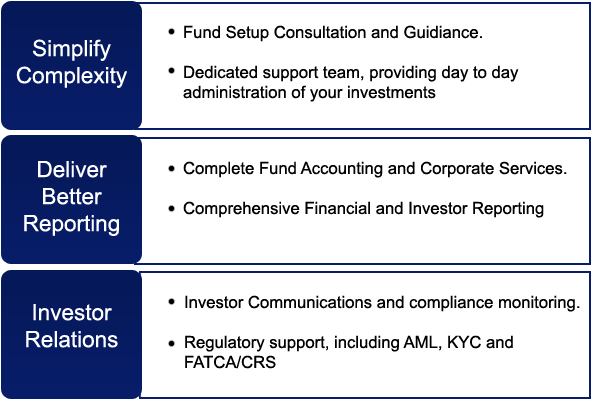 The investor services team works closely with the fund accounting and corporate services team to ensure accurate and timely delivery to the investors. As Private Equity funds are coming under increasing regulatory and market pressure to deliver greater transparency, better reporting and tighter accounting processes, it makes sense to move towards an outsourced administration model. Reduces costs and increases efficiencies for the fund. We take away the administrative burden from the Investment Manager. Partner with the investment manager to offer the investor the best experience. Gains efficiency and consistency in an ever-changing regulatory environment. Professional expertise allowing the investment manager to focus on asset management. Provides speed, transparency and accuracy for reporting to investors. Adds credibility to funds and improves risk management.